Within most of our hearts lurks a literary glimmer. 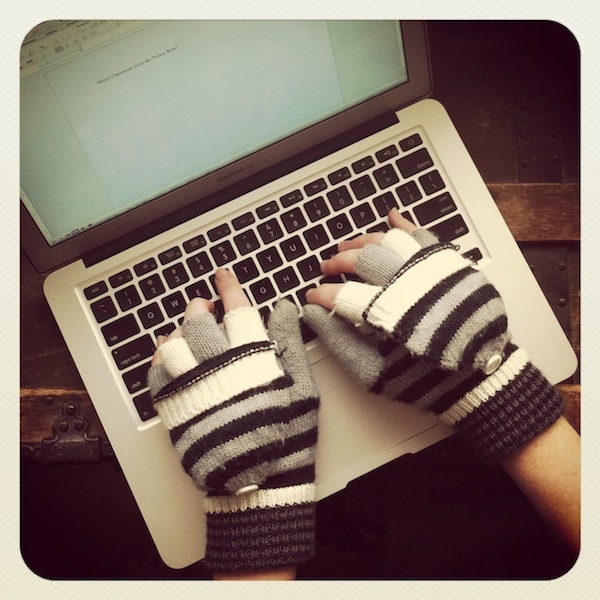 But whether you’re penning the next great American novel or simply adding a grandiose flourish to your office memos, there’s something about fingerless gloves that adds a dash of romance to your look. We’re not talking the lacey Madonna circa 1980s style here; think more of a Dickensian heroine or Austen character. Slip on a pair and feel instantly transported to a bygone era where dressing each day was truly an art form. This old fashioned charm is what makes fingerless gloves so appealing to me, not to mention they keep your hands warm and cozy whilst conveniently leaving fingers free to type and text. Check out Anthropologie for a refined pair in brown leather, or head over to Etsy for some uber-cute choices if you prefer your gloves to look as though a kindly, bespectacled grandmother knit them. True, you don’t need to possess literary aspirations to don a pair of these hand accessories, but doing so just might release your inner muse.